Total protection. 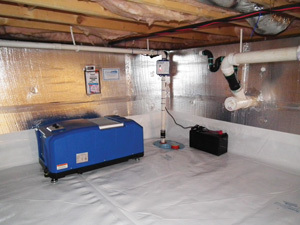 This Basement Systems waterproofing system includes a sump pump with battery backup (for protection during power outages) and a heavy-duty SaniDry™ crawl space dehumidifier. Building scientists and other building experts recommend that crawl spaces be sealed or encapsulated. This upgrade makes buildings more energy efficient and eliminates problems with moisture, mold and pests in the crawl space. Some crawl spaces also need to be waterproofed. How do I know if my crawl space needs waterproofing? There are several signs that indicate a waterproofing system may be necessary in a crawl space. One obvious sign is standing water on the crawl space floor. If the crawl space has a dirt floor, wet soil can also indicate that a waterproofing system should be installed. Products that promote good drainage. Installed beneath the vapor barrier, dimpled plastic drainage matting promotes good drainage along the crawl space floor. SmartPipe™ perimeter drain pipe collects water from floor and wall leakage, transporting it to a crawl space sump pump. This photo also shows SilverGlo™ wall insulation. What features are included in a crawl space waterproofing system? Perimeter drains. Patented SmartPipe™ perimeter drain pipe is designed to capture crawl space wall and floor seepage. Drainage matting. 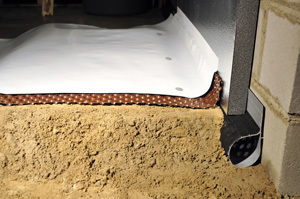 This dimpled plastic sheet material promotes good drainage over the entire crawl space floor. Sump pump. Basement Systems provides the best-performing sump pump systems available, including battery backup models that keep working even when the power goes out. Dehumidifier. A heavy-duty SaniDry™ dehumidifier from Basement Systems will dry out a damp crawl space and automatically maintain a pre-set humidity level. By controlling crawl space humidity, you create conditions that are hostile to mold and mildew. Crawl space waterproofing can be completed as part of crawl space encapsulation or independently of it. Whichever option you choose, you’re sure to get the best performance and best value from a Basement Systems contractor. We have exclusive access to top-performing products for sealing, insulating and waterproofing your crawl space. Give us a call to request a free estimate or find a CleanSpace® installer in your area to learn more about how they can help!